Commit yourself to one full year of active membership to a Toastmasters club. Planning to only being part of Toastmasters for a month or two, or until you begin to feel more comfortable presenting, will shortchange your experience. It would be like deciding to learn how to ride a bike, but only to the point of balancing in a stopped position. Acquiring public speaking skills is something that needs to become part of you over time, like the practice of martial arts. Invest a full year in the Toastmasters program, and you will have a near 100% chance of attaining any speaking goal you have when you join. Use the Find a Club locator at Toastmasters.org and search for clubs near your home or work location. Choose three clubs that meet at a time and day where you can prioritize your entire week around that meeting date so you can attend almost every meeting. Visit each club before settling on a decision of which club to join. Find the president of the club and ask prior to the meeting if you will need to introduce yourself to the group at the beginning of the meeting and if you will be expected to participate in Table Topics. At our club, we suggest to guests that they simply relax and watch the show. Occasionally, we might ask guests if they want to try a Table Topic, but we never force guests to participate. Table Topics comprise a section of each Toastmasters meeting where members are called to the front individually to respond to a question where no prior knowledge of the question was given. The response is 1-2 minutes in length and is great practice for learning the skills involved with impromptu speaking. Get confirmation from your place of work that you will be able to attend the weekly meetings if your chosen club meets during your work hours. Most of the time, you will find employers to be highly supportive of your desire for self-improvement through Toastmasters. Most employers recognize as your improvement progresses, you will get more sales, offer better customer service present information better at meetings and improve the overall bottom line for the company. In fact, some employers reimburse their employees for joining and participating in Toastmasters. Once you select a club to join, visit it for at least one more meeting to make sure their meeting runs as impressively this time as it did the first time you attended. Complete the Toastmasters new club member form. This will be presented to you by the VP Membership. Bring a check with you or cash to the meeting so that your 6-month payment can be made along with the completion of the form. The highest 6-month membership you will pay (dependent on the prorated semi-annual dues date) is the new member fee of $20 to Toastmasters International, which gets you your first round of instructional manuals + $45 semi-annual dues. Then, if your club has any club dues (ours are $2/month), you will be charged those as well. Will you attend meetings frequently? Will you prepare fully for each assignment you are scheduled to perform? Will you apply yourself to learning and abiding by the communication and leadership objectives as outlined in the manuals supplied by Toastmasters International? Will you agree to meet in person with [the new member] to listen to his personal and professional goals? Will you agree to encourage [the new member] to pursue speech objectives as set forth by Toastmasters International? Will you agree to assist [the new member] in understanding and performance of each role assigned as described in the George Sutton Toastmasters Club Member Manual? Be ready to participate. After your new member induction, you will likely be asked to participate in the Table Topics section of the meeting. You will be brought up to the front of the room and asked a question for which you are to respond for 1-2 minutes. Plan to stay after your first meeting. Your assigned mentor will likely want to meet with you at the end of the first meeting to learn more about your goals and challenges. Plan for your Ice Breaker. The VP Education for the club will get you on the schedule a week or two or three from now for delivering your Ice Breaker speech. Your Ice Breaker is the first speech objective in the Toastmasters Competent Communicator manual. As you evaluate various Toastmasters clubs in your area, expect the professionalism and organization level to vary greatly. Not every Toastmasters club has such an organized sequence for you to follow when you join their Toastmasters club as in the list above. 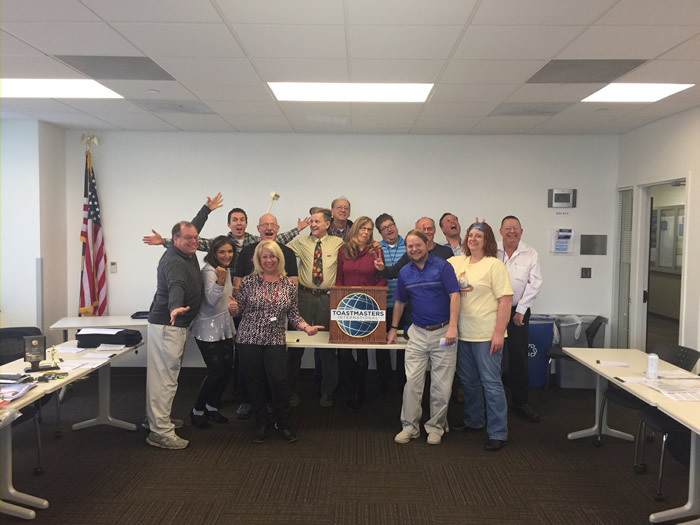 At the George Sutton Toastmasters Club, in Aurora, CO, our members join because they appreciate the professionalism, organization, and pre-planned approach to conducting meetings. And, they benefit even more when called upon at their jobs or businesses to conduct professional events outside of the Toastmasters club. If you are in the metro Denver area, we encourage you to come visit our club and see if it’s right for you. Even though our club is in Aurora, we have had members from Conifer, Castle Rock, the Tech Center area, Parker and Broomfield. Contact us with any questions or let us know if you plan to attend so we can expect you.